The Carton Sealing and Strapping Combo System is a packing machine which integrates the function of sealing and strapping cartons automatically; It can be equipped in the automatic packaging line, seal tapes on the top and bottom, strap machine with several belts, and improve the automatic packaging degree in the end Line. It is of high efficiency and widely applied in mass production industries like toys, home appliances, printing pharmaceutical, electronics, daily necessities, etc. 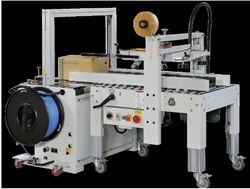 Looking for Combo system - Auto sealing and strapping line ?